Gas central heating included in the price. Electricity not included - £1 metre. 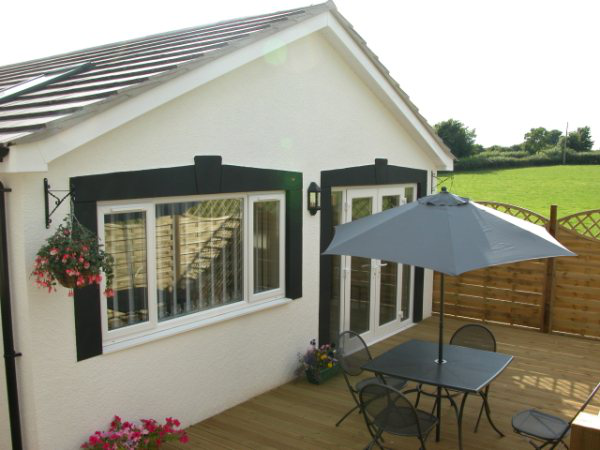 Bwthyn Gwyn Luxury Holiday Cottage is located near Porthcawl, South Wales. A five minute walk from the huge Warren of Merthyr Mawr Sand Dunes and Newton Beach, the cottage is positioned in beautiful countryside, which offers a peaceful and tranquil setting. Ideally located for those who are looking for outdoor activities such as walking, cycling, surfing or wind surfing as well as golf and horse riding. Open plan kitchen / dining area / lounge - The modern kitchen is fully equipped and includes an electric cooker, microwave and fridge/freezer. The cottage has been refurbished to a very high standard to provide comfortable and tasteful accommodation. Both the double bedroom and twin room have been tastefully decorated and furnished to a high standard. The bathroom offers a modern white suite with quality wall and floor tiling. A purpose built wet room is situated adjacent to the cottage. It is equipped with a shower, washing machine and tumble dryer. It has ample room to store out-door gear such as bikes, surf board etc giving you the assurance of knowing that all equipment is stored in a secure, lockable storage area. There is a hose pipe hanging on the outside of the wet room where all equipment can be washed down before storage. There is an outside garden with decking area where guests can enjoy sitting and relaxing in the tranquil setting and take in the superb countryside views.